Qattara Depression Project: Time to Revisit? The Qattara Depression is a large low-lying area in the desert of north-west Egypt. Its lowest point is 133 meters below sea level. If the depression were flooded to sea level, the lake formed would cover nearly 20,000 km² — comparable to Lake Ontario. It would come within 55 km of the Mediterranean coast of Egypt near El Alamein. Ever since the depression was first mapped by the British after the First World War, there have been proposals to link it to the Mediterranean by canal, tunnel, or a combination. Hydroelectric power from seawater flowing into the basin has been the primary interest. The area is hot and dry; rapid evaporation would enable a large inflow of seawater to be sustained indefinitely. The lake formed could support settlements along its shores with local fishing and salt mining economies. It could be expected to cool the region and to increase rainfall as well. Wikipedia has a fairly good article on the history of project proposals. Despite nearly a century of studies and proposals, and despite high interest on the part of Egyptian authorities, all plans for development of the depression have come to naught. In the end, they foundered on the analysis of costs vs. benefits and risks. A lot has changed, though, in the four decades since the last feasibility study was commissioned — and ultimately rejected — by the Egyptian government of Anwar Sadat. Perhaps it’s time to revisit? A major problem for development of the Qattara depression has always been the high cost of the link to the Mediterranean. The depression is bounded on its north side and separated from the Mediterranean by the El Diffa Plateau. At an average elevation of a bit over 200 meters at the top of the plateau, it’s not especially high. However, it’s high enough and rocky enough that carving a canyon through it to open a sea level canal to the Mediterranean would be a giant undertaking. In fact that last feasibility study proposed a series of 213 underground nuclear explosions as a cheap way to excavate the canal. That just might have had a bearing on its rejection by Sadat’s government. A sea level canal cutting through the El Diffa Plateau isn’t the only possibility, however. With modern tunnel boring machines, for example, driving one or more sea level tunnels under the plateau would be feasible. Not cheap, perhaps, but feasible. If tunnel boring technology lightens the cost side of the balance, climate change has added new weight to the benefits side. The need to decarbonize is driving a worldwide move to renewable energy. The move is aided by plunging prices for wind and solar energy capacity. It creates a solid market for megascale pumped hydroelectric storage. At the same time, cheap wind and solar have undercut the value of baseload hydroelectric. Power from the flow of Mediterranean waters into the depression is no longer the only viable way to charge the pumped storage system. Nor is it necessarily the cheapest. Those facts suggest a different, more incremental approach to the project that might make it easier to finance. Climate change and the need to feed, house, and provide work for refugee populations, also elevate the importance of the ecological and economic development aspects of the project. “Terraforming” of the Qattara depression would be a non-trivial undertaking. The area, larger than the nation of Lebanon, is totally uninhabited outside of a small oasis at its western edge. There are reasons for that; I’ll get to them. But the problems seem tractable. Transforming the land and climate in and around the depression may prove the most compelling reasons to implement the project. To get an understanding of the issues, we’ll summarize a baseline plan derived from previous studies. Then we’ll consider how recent changes in the world might affect it. For the baseline, we can use a variant of the Bässler plan that Wikipedia features in its article on the Qattara project. We’ll posit a tunnel under the Diffa Plateau rather than the bomb-excavated canal that Bässler advocated in his proposal to Sadat’s government. The plan includes a manmade reservoir atop the plateau for pumped hydroelectric storage. There’s an underground power station with lake intake and discharge gates at the 60 meter BSL (below sea level) contour. The power station has a set of one-way turbine-generators for power generation from the tunnel inflow to the lake. It has another set of bidirectional pump-turbine motor-generators for operation between the lake and the reservoir atop the plateau. The 60 m BSL target for Qattara Lake was chosen by Bässler — and most of his predecessors as well — to maximize hydroelectric power generation. A lower lake level would have provided more head and allowed more energy to be generated per cubic meter of water. However, the lake would have had less surface area and a lower net rate of evaporation. That would have reduced the sustainable rate of inflow and the sustainable power generation level. So what is the sustainable power level? According to survey data, the 60 m BSL lake would have a surface area of 12,100 km² and a volume of 227 km³. There’s some question as to just what the evaporation rate would be once the lake was established. The lake would make the area cooler and more humid than it is now. One estimate I found, extrapolated from measurements taken around lake Nasser (behind Aswan dam), was 5.2 mm per day for a freshwater lake. For seawater that would drop to 5.0 mm / day (1.8 m / yr.) The net evaporation from the lake then comes to 700 m³/s. With a 60 m head and 100% efficiency, that would give an average sustainable power level of 412 MW. There is some loss of head in the transport tunnel from the Mediterranean, and 90% is a more realistic power conversion efficiency. There is also a small reduction in the sustainable rate of inflow from the Mediterranean due to existing inflow of groundwater. Taking these factors into account, Bässler figured a sustainable inflow of 656 m³ / sec and power level of 315 MW (per this UN Archive report). (Bässler apparently also figured a slightly lower elevation for the lake surface: 62.5 m BSL. The 60 m BSL was from Dr. John Ball’s earlier study and proposal). The pumped hydro power level could be substantially higher than 315 MW. How much higher would depend on what peak load the system needed to supply for how much time, versus the fraction of baseload capacity diverted to storage pumping. With 315 MW baseload and no solar energy input, a peak capacity of 1,500 MW seems about the most that would make sense. The baseline plan has a problem. 315 MW isn’t very impressive for a large hydroelectric project. And to transport 656 m³ / sec of seawater over 55 to 80 km with only a 10% (6 meter) loss of head, one needs a very large tunnel — 15 meters in fact. That wouldn’t be a world record tunnel length or diameter, but it wouldn’t be far from it. A puny 300 MW of baseload power generation, by itself, could not justify the cost. Even adding in 1.5 GW of pumped hydro for a couple of hours a day, it doesn’t seem a good investment. If the project is to be worth pursuing, justification will have to be found elsewhere. That may be possible. The baseline plan doesn’t consider solar power and the value of pumped hydro capacity for sustainably powered economies. 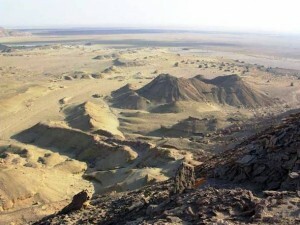 More importantly, it doesn’t consider the unique characteristics of the Qattara Depression that make it a good candidate for positive ecological and economic development. By mid century, Qattara could potentially grow from the bleak uninhabited region it is today to a fertile homeland for tens of millions. And even in early years of the project, it could provide settlements and livelihood for thousands of refugees from the violence, turmoil, and famine currently plaguing much of the Middle East. In the long run, it could also provide jobs for millions of unemployed among Egypt’s younger generation. But I’m getting ahead of myself. First we need to look at those “unique characteristics” and see how they might figure in a feasible development plan. In real estate, a “fixer-upper” is run-down house on the market at a low price, but typically described as “having potential”. It just needs “a bit of fix-up work” to realize that potential. The term isn’t applied to vacant property, much less to whole geographic regions. But if it were, the Qattara Depression would qualify. In military histories of the WWII North African campaign, the Qattara is famous as the southern anchor of the British El Alamein line that stopped Rommel’s eastward advance. The British didn’t need to extend the line further south, because the Qattara was impassable to any mechanized infantry force. Even Germany’s “desert fox” couldn’t find a way through it. What made the depression impassable was its combination of fine loose drifting sand in some parts, rocks and wind-carved cliffs and gullys in others, and wide expanses of treacherous salt marshes and crusted mud flats that could swallow heavy vehicles trying to cross them. Despite its location in the Sahara Desert and its extreme arid climate, the Qattara Depression does not lack for water. In fact, it has too much. the Mediterranean sea to the north, seeping under the Diffa Plateau. The total volume of the groundwater flow has been estimated to be as much as a billion m³ per year. However, it’s spread over a very large area. It seeps to the surface slowly and evaporates without forming lakes or runoff channels to the lower parts of the depression. As the water evaporates, it leaves behind any dissolved salts it carried. The surface becomes encrusted with salts, unsuited to plant growth beyond the extreme halophytes of the salt marshes. Reclamation of the land, under these conditions, is labor-intensive but straightforward. It involves trenching of fields and installation of drain pipe, after which the trenches may be filled in. The fields are then irrigated with freshwater to flush the salts. The brackish flush water is collected in the drains and channeled to evaporation ponds. The water for flushing would come from local wells in areas where groundwater is adequately fresh. Those would likely be the first areas targeted for reclamation. In other areas, wells might produce water that was brackish, but with salt content low enough for economical desalination. Fresh water could also be imported by pipeline directly from the Nile river delta a few hundred kilometers to the northeast. Alternatively, it could be imported from large production wells tapping the Nile delta aquifer at lesser distances — provided that the pumping did not lower the aquifer enough to impact wells in communities near of the delta. After salt removal, the land can be planted with hearty, “green fertilizer” crops. That begins a long process of soil-building for enhanced fertility and crop production. The process might include application of biochar and compost from biomass grown in the salt marshes. I’m no authority on soil-building, but I know that it can be done. 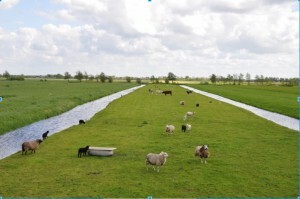 The possibility is well proven in Dutch polders, reclaimed from former sea bed after building dikes. As long as there is a reliable supply of fresh water and the modest energy needed to pump shallow wells, it’s just a matter of time and informed care. Qattara provides the first, solar panels provide the second, and refugee families and volunteers could provide the last two. What of the massive pumped hydroelectric storage that the project was originally about? Or the inland sea that would support fishing and commerce while transforming the climate and bringing rainfall to a big swath of the Egyptian desert? Those elements remain in the plan, but pushed back to a later phase. They aren’t needed in the early stages, and there’s no point to spending capital needed to build them before a seed population and infrastructure to take advantage of them have been established. In the first stage of the project, there would be a good deal of solar PV capacity brought in. But since most of it would be devoted to pumping water — something that can be handled quite nicely with “as available” power from solar arrays — there’s no immediate need for large-scale pumped hydroelectric storage. A modest pumped hydro capacity would be valuable for providing power to the settlement camps at night and for running waste treatment and brackish water desalination plants on an efficient 24-hour schedule. With a 300 meter elevation drop in many places between the rim of the Diffa Plateau and the bottom of depression below it, the Qattara Depression remains a very favorable location for pumped hydroelectric storage. Modest storage capacity of a few tens of megawatt-hours doesn’t require an inland sea to serve as the lower reservoir. With 300 m of head, a 10 MWh pumped hydro “battery” requires storage of about 12,000 m³ of water. That’s an upper storage reservoir / holding tank 80 m diameter by 2.5 m deep. That’s relatively easy to manage, and even a factor of 10 greater would not be difficult. That level of storage should be adequate for initial settlement in the early stages of the project. Pumped groundwater or drainage from desalting of fields would supply more than enough water. In middle stages of the project, solar power capacity would be ramped beyond the needs of the project area itself. As more capacity was installed, an increasing fraction of power production would be exported to Alexandria, Cairo, and other cities along the Nile and the Mediterranean. At that point, the market for pumped hydroelectric storage would expand, and construction of much larger holding reservoirs and power plants could begin. Land reclamation would continue, and expansion of agriculture might see modest export levels of some foods. At some point not far into the project, aquaculture would be introduced. Initially, pumped groundwater would be ample to supply fish tanks and ponds. As more settlers moved in, however, a system of larger salt water lakes and canals would be helpful for commerce and general fishing. For that, import of Mediterranean seawater would probably be needed. It still wouldn’t be necessary to open a sea level canal or drive a large tunnel through the Diffa Plateau. The water could simply be pumped over the plateau by pipeline. Power generated on the downhill leg of the pipeline would be adequate to drive the pumps for the uphill leg. Since the descent into the depression would be at least 50% greater than the ascent to the plateau, there would be a surplus of power generation. Pumping, generating, and transmission losses would eat into the surplus, but with efficient pumps and turbines, they wouldn’t consume it all. Hence, the seawater pipelines could be self-supporting. Pumping seawater through pipelines over the Diffa Plateau can’t support shipping between the Qattara Depression and the Mediterranean. If development of the depression is successful, shipping capability will become very desirable. That’s when a large sea level canal becomes interesting. It should be noted that the issue with a large sea level canal from the Mediterranean is one of cost, not technical feasibility. The amount of material that would need to excavated would be in the range of one to two cubic kilometers. The actual amount would depend on the route of the canal and how wide the cut through the highest parts of the Diffa Plateau ended up being. One to two km³ is certainly a lot of excavation, but it’s several times less than what has come out of some of the world’s largest open pit mines. It compares to the amount of overburden stripped to expose coal seams in any two years of operation in the Powder River Basin of Wyoming. Excavation would probably be needed also for construction of a sea level harbor at the Qattara end of the canal. I’m assuming that a sea level harbor would be desirable as a distribution hub for the growing cities and towns within the depression and surrounding areas. Large container ships and tankers could dock in the harbor with no need to pass through locks. Smaller ships able to negotiate the BSL network of canals built earlier to link communities within the Qattara would shuttle cargo between those communities and the main harbor. The locks or boat lifts needed to enable passage between the main harbor and the lower canals would be a fraction of the size needed for large ships. If and when a large sea level canal is built, it will completely change the picture for pumped hydroelectric storage. Adding capacity will no longer require building new storage reservoirs atop the plateau. The entire Mediterranean Sea will become the upper storage reservoir. The unreclaimed lower portions of the depression will quickly fill to the planned 60 m BSL contour of what we may as well dub the Qattara Sea. The sea would serve as the lower reservoir for a colossal pumped hydroelectric system. A sea level canal large enough to permit passage of oil tankers and container ships could handle flows more than an order of magnitude larger than the long term average imposed by evaporation from the Qattara Sea. The high rates couldn’t continue for long; a temporary inflow of 10,000 m³ / sec, for example, would raise the Qattara Sea at a rate of nearly 6 cm per day. But it would allow generation of 5 GW for several hours a day for weeks at a time — or indefinitely if it were offset by high pumping rates from surplus solar power at other times. Such massive pumped hydroelectric storage would avoid the need for hundreds of gigawatt hours of dispatchable output from inefficient fossil-fueled peakers and dispatchable coal-fired power plants otherwise needed to back irregular wind and solar PV resources. It could provide clean dispatchable power well in excess of the needs of the Qattara project itself. The market in Europe for that excess capacity might justify construction of the first trans-Mediterranean HVDC transmission line. That would break the “chicken and egg” situation that has stalled the Desertec initiative. By providing access to the European power market, an HVDC line from Qattara could kick plans for more desert solar power plants out of the limbo in which they’ve languished in the absence of transmission capability. The HVDC line could potentially kickstart implementation of the integrated Medgrid. This article has been, in part, a teaser. There are issues I haven’t touched on, and thoughts about how to address those issues that I haven’t written about. There’s also a great deal of information about the Qattara that I haven’t yet been able to nail down. Among other things, I’d love to know why the Desertec and Medgrid initiatives seem to have ignored the pumped hydroelectric potential of the project. The must have known about it. Perhaps it smacks of geoengineering, anathema to some Greens? Or perhaps they have considered it and found substantive issues I’m not aware of that rule it out. I don’t know. In a time of climate change, drought-related famine and sectarian conflict, I do see the issues around the Qattara and its possible development as vitally important. The issues go well beyond the future of Egypt and its economy; they touch on the health and stability of the entire Europe – Middle East – North Africa or EUMENA region. I’d like to see them laid out and explored in a solidly researched and documented e-book, for consideration by the UN, World Bank, or other agencies that might be in a position to sponsor engineering studies and perhaps exploratory development. Location and status of WW II minefields in the area and state of de-mining operations. I’m open to suggestions for a web-based home for the project. My default would be something set up on a Google Drive, but there might be options that would work better for more people. And, as always, everyone is welcome to leave comments and/or suggests below — even if it’s only to tell me what a naive dreamer I am. Thank Roger for the Post! You think on a big scale. Who am I to argue? On a much smaller scale, more readily understood, I would first think this region would be ideal for some solar electric matched to some hydrogen gas fuel production. Instead of moving sea water inland, just move hydrogen gas and use the gas for off peak electric and pure water. A little devil’s advocate conventional wisdom you will likely encounter, anyway. Thanks for the comment, Rick. But actually, I consider that I’m approaching this on what I think of as a smaller, more practical scale — as opposed to the grand “build it and they will come” approach that has characterized past proposals. I’m specifically not proposing that the project begin with construction of a great sea level canal from the Mediterranean that would flood the depression and create the Qattara sea. I’m suggesting that it start small, by providing groups of pioneer settlers with what they need to survive and begin land reclamation in areas above the eventual flood line. What they need is mostly solar powered water pumps, food, shelter from the sun, sanitation and clean water systems, plus tools and supplies for trenching the fields and establishing drainage. Once there are viable settlements that are able to grow some crops and demonstrate that the region can be successfully settled, then the project can be ramped up. There will be a support base for a larger labor force, and exponential growth can be allowed to do its thing. The end point of the formal project — the opening of the sea level canal and the giant pumped hydroelectric station — might be characterized as grand scale. The question is, is it grand enough to make a real difference to the problems its aiming to address? Thanks for the added perspective. Perhaps this one step at a time perspective has precedent in settlement initiatives I’m aware of. I saw a documentary on the “Matanuska Valley, Alaska colony settlement of 1935 organized by FDR. It crystallized the memories told me by my ancestors who settled the Red River Valley of the North in the 1880s. The way I tell it, James J. Hill built a railroad to nowhere, suckered some starving Scandinavians with a promise of free land if you get on the train. When they arrived at the end of the line they wondered where is the town? But they grew crops that fed the world, and towns, and did what working people do; they worked! The technology is always a question, but railroads were new ideas not that long ago. I certainly think your idea is infinitely better than spending ever more money on wars. There seems to be 2 species of humans; builders and destroyers. A pioneer is often just running away from the latter. I do not know how “Flat” the plateau is. Maybe it is possible to build a chanal not on sea level, but as a more or less long lake at e.g. 100m above sea level, allowing pumpes storage between this lake and the mediterran at one end and between tis lake and the Quattara lake at the other end, and as a sideffect transfering seawater into the lake. Just to provide a Idea. For substantial diurnal storage, add a “0” at the number of GW required and remove one for the time the power has to be delivered. In north africa the sun is very reliable, and solar power follows seasonal demand. Thanks for that link, Helmut. I know there’s been a lot of talk and interest about HVDC links across the Mediterranean for a long time, but it’s good to see something specific. I don’t know how flat the plateau is either. I did find an archive of maps by the U.S. Army core of engineers, but they’re hard to work with. That’s why the top of my wish list for the crowd sourced e-book project is someone with access to a good GIS database and tools for generating custom maps. From what I can tell, however, the top of the plateau is not at all flat. Nonetheless, I like your suggestion. A canal across the plateau at a 100 meter elevation is bound to be only a fraction of the cost of one cut all the way through at sea level. And it could indeed serve as a distributed upper reservoir for a pumped hydroelectric system. It would be a unique type of hydroelectric system. Three reservoirs rather than two. The pumped upward leg would be half the height as the downward generating leg, so there would definitely be net generation. It wouldn’t just store energy put into the system, it would amplify it! It would also be possible to size the canal for passage of fishing boats and canal barges. It would mean multiple sections of the canal at different levels with boat lifts between them. But as I wrote in Cruising to Vegas, boat lifts can be quite efficient. They’re also relatively inexpensive. A stepped canal would open boat and barge passage between the Mediterranean and the Quattara Depression. That’s bound to be helpful to the logistics of developing the depression. In fact, I’m now thinking that a a canal network within the depression would be more efficient and more economical than a road or rail network. It tuns out that in saturated soils, it’s much easier to build canals than roads. If canals became the major transportation infrastructure, it would give the developed Qattara its own unique cultural flavor. Well, that’s perplexing. The first time I clicked that link, it took me straight to the intended page. I looked it over briefly, but only skimmed it. Now when I try to return, however, it takes me to a login page. And the “create account” form won’t accept a “3rd party” e-mail address (e.g., anything @gmail). It insists on a “business e-mail address”. Annoying. I wonder what changed. Yes this is strange – but the project exists and at some other site from which I do not remember the URL the landing point would be somewhere between el alamain and the lybian border. Google earth should allow to do profiles of the are, but I do not have installed here yet, so I will have to switch to another computer. the platoe starts around 30-50m above sealevel at the mediterran, and rises then to mostly 200-220m an then falls steep to -80m. Short behind maximum height there seem to be some natural basins with a ground level around 130-150m above sealevel, which would be interesting to look at further. If the project is reasonable is another question. It would also be interesting what will happen with the groundwaterlevels around, if the water can not escape any more into the qattara basin, but gets counterpressure from the seawater there. ground water levels towards nile could rise. Since the storage woulnd need to have some volume, and enough crosssection to have a small flow resistance, it would allow to move bigger ships too, the question will be if transportation needs will finance the neccesary infrastructure to lift the ships. So google earth is up and running. The lowes approach I fund runs from el alamain directly south, slowly rising from zero to 98m at km 42,6, then rising steeper to143m at km 48, then a slower rise to 151m at 53,1, then a sharp drop at km 56 to 30m, the a further drop till -18m at km 60,6. From then on moving westwards, in a natural valley slowly dropping to -60m at km 120, here a series of dams across the valey would do the trick, they would need to be just e.g. 20m high, but about 5-10km long. Yes, I’d expect to see the water table raised in the areas above the part of the depression that was flooded with seawater. In fact, given the way that groundwater flows toward the lowest parts of the depression, I don’t see how creating a large lake there could fail to raise the water table in surrounding areas. In most cases, that should be good for biological productivity of the area. There’d be more places where trees could sink their roots to the water table, and new springs might show up. Perhaps even small streams flowing toward the lake. In the worst case, it might be necessary to use trenching to preserve normal soil drainage and prevent grazing areas — which do exist — from turning into stagnant marshland. But that should be pretty easy. A friend who doesn’t post or comment here asked me a good question offline. It was a question about sustainability — a topic dear to my heart. With seawater continuing to flow into the depression to offset evaporation, wouldn’t the Qattara Sea become increasingly saline over the years? Wouldn’t it eventually become as hyper-saline and lifeless as the Dead Sea? Does trying to establish a seafood fishery there make any sense if it is destined to die out as the sea grows increasingly saline? It’s possible to maintain close to normal seawater salinity indefinitely for a large portion of the sea. It can’t be maintained for all of it, short of heroic levels of desalination and salt removal. The sea must be divided into separate parts: a normal salinity part where the fishery resides, and a hypersaline part that serves as an outflow for the normal salinity part. There will be some level of freshwater inflow to the normal salinity part of the sea. The freshwater will come from groundwater inflow, field drainage, and outflow from the tertiary treatment lagoons of settlements around the sea. The outflow from the normal salinity part into the hypersaline part will be just the sum of the seawater and freshwater inflows, less the evaporation from that part. To hold the salinity constant, the outflow must carry away as much salt as the seawater inflow brings in. If the salinity of the fishery water is required to be the same as the seawater flowing in, then that part of the sea must be small enough that evaporation from its surface just matches its freshwater inflow. If a 20% higher salinity is acceptable, then the fishery waters can take up slightly more area. The outflow to the hypersaline part of the sea only needs to be 80% as large, by volume, as the seawater inflow. That means that evaporation from the fishery can match the freshwater input plus 20% of the seawater input. The fishery waters will form a horseshoe lake between the shoreline and the interior hypersaline sea. The two could be separated from each other by a running dike built before flooding. The dike need not be strong, as the water levels on opposite sides would be the same. The hypersaline inner sea would also have an outlet. It would be at the bottom of the horseshoe, and would flow into a network of working salt ponds. Production of salt and associated minerals would become an economic anchor for the Qattara region. If you want to create a lake, I would almost be willing to bet, you could start covering the area with floating solar panels, and it would knock out enough heat to slow the evaporation. We are getting to the point where pumped hydro is more expensive and less efficient then batteries. It also doesn’t load follow as quickly.